Appearing for court is not optional once the Judge has set a hearing date. It is not uncommon, however, for people to miss a Court date for a number of reasons. Maybe you were out of town, forgot the date, were not told you needed to be in Court, had an emergency, or simply were too afraid to show up. Whatever the reason, failure to appear for a scheduled court hearing can result in additional charges and lead to additional legal problems. Bretton Barber is a Phoenix criminal defense attorney who handles failure to appear cases and works to minimize the damage. If you have failed to appear in Court then the issue will not go away. Contact our office right away to take care of the problem. We represent defendants throughout Maricopa County including the cities of Mesa, Glendale, Scottsdale, Chandler, and Gilbert. We also assist Pima County residents in Tucson. Two things typically happen when you fail to appear in an Arizona Court. First, a warrant is issued for your arrest. Second, the warrant is put into a database which links to the MVD. This means that if you are stopped by law enforcement, for any reason, you are facing the possibility of being arrested on the spot. The longer the situation drags on then the more trouble you will be in when you are eventually caught. Hiring an attorney sooner, rather than later, can assist you in rectifying the situation. Bretton assists Phoenix residents who have failed to appear for a court date. He will immediately file a Motion to clear an arrest warrant. He will quickly inform you of the hearing date so that your case may get back on track. Bretton will present the Court with a reason on why your case should be allowed to proceed and work to ensure that it does. He will stay in regular contact throughout the process so that you do not have to worry about whether things are being handled. Arizona law enforcement is not patient. If you have missed a court appearance then call our criminal defense lawyer today. Bretton is able to assist with the underlying issue for which you missed a court date. Matters handled by the Barber Law Group include charges for domestic violence, assault, DUI, felony cases, and misdemeanor charges. 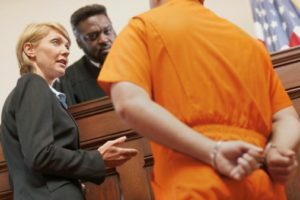 Our criminal defense lawyer devotes his practice to this area of law as he is passionate in regards to society’s need to ensure that the rights of the accused remain protected. Bretton takes great pride in the level of service he provides to Phoenix residents and he is ready to assist you. Call today.